On 6th February 1587, in the Great Hall at Fotheringhay Castle, the warrant for her execution was read aloud to Mary, Queen of Scots. It bore the flamboyant signature of her cousin, Elizabeth I, Queen of England, and was the culmination of nearly 20 years of captivity. Mary had come to England as a supplicant, following the defeat of her forces at the Battle of Langside in 1568. She hoped the English Queen would support her in regaining the throne that she had lost following the tumult that erupted after the assassination of her husband. 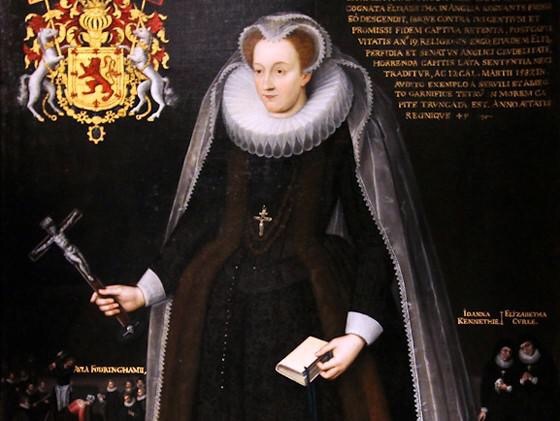 Elizabeth, strongly influenced by her Secretary, Sir William Cecil, who had an implacable distrust of the Catholic Mary, had held her captive in a series of locations across the north and midlands of England. Numerous plots to free her and put her on the English throne, some undoubtedly with Mary’s support, had finally culminated in a trial that Mary refused to recognise and a death sentence.